For further instructions, we have a step by step guide to for installing Hotjar with the Official Hotjar Plugin. Copy the Tracking Code from the Hotjar admin. 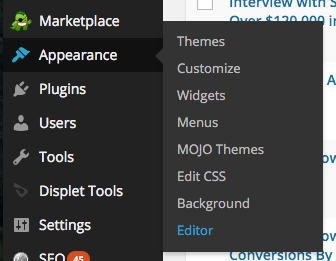 Open the WordPress Editor within the Appearance menu. Editing the theme this way changes the code on your website's local copy of the theme. If the theme is updated or re-downloaded at a later date, you might lose any changes. The header.php file will load. It may not look exactly like the file below, but the basic structure should be similar. Add the Hotjar Tracking Code just before </head>. The header.php file you see might not contain any <head> HTML tags. If it doesn't, you'll need to find the correct file in your theme that does contain this tag and continue from there. Your theme's designer or a WordPress specialist would be the best place to start in this case. If your WordPress blog uses any caching plugins, you may have to clear your cache to make sure the script is added to your site. Once you have added the Hotjar Tracking Code to your site, you will need to wait a few minutes for Hotjar to check if it is installed correctly. This usually happens the moment your site is loaded with the Hotjar Tracking Code on it (you can visit the page yourself to speed it up).